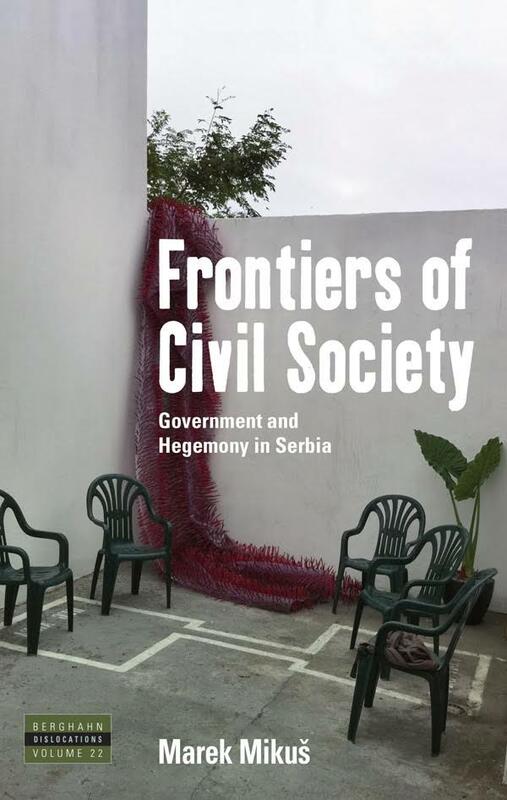 Kate Crehan talks with Marek Mikuš about his recent monograph Frontiers of Civil Society: Government and Hegemony in Serbia and how the work of Antonio Gramsci can inspire anthropological thinking about civil society and inequality. KC: You describe your book as adopting a historical anthropological perspective, but your book is also very much a classic ethnography in that you studied a particular group in a particular place, at a particular moment in time. Can you say a little about your methodology? MM: I think a sense of long-term history is very important when you write about things like civil society, the state, and government reform. You do fieldwork in particular places, but you also try to find historical precedents for the situations that you’re looking at. I try to be very explicit about the historical context I’m writing about, and to think about my subject matter as historical process. For instance, in the chapter about Vršac [a town in Serbia’s northern province of Vojvodina], I observe a network of activists advocating for changes in the management of a local historical park, but I also dig out the last fifteen or so years of their involvement in decidedly “informal” local politics, which their advocacy project ultimately had to engage with. So you can think about the historical embeddedness of situations at different levels; it’s not necessarily only national and global history but also local history and organizational history. In the Vršac chapter, I combine observations of the advocacy project meetings, interviews with stakeholders and archival research to reconstruct how in the postsocialist period local politics were shaped by the shifting relationships of competing networks straddling party politics, private business, and “civil society,” as well as by changes at the national level. Why did you turn to Gramsci in your work, and how is his approach particularly useful to you? I also found the established critique a bit too cynical. Of course there are people who are involved in activist groups for mostly instrumental reasons, but that wasn’t really my experience in Serbia. Many people were invested in various ideas about development and grappled with the contradictions between their expectations and realities of postsocialist transition. And in Gramsci, I found a way of analyzing this. You have organizational crystallizations, but behind them are wider narratives about different groups and interests in society, which in turn inflect how class relations are articulated and become politically effective. Another thing that was very compatible with the Gramscian framework was the importance of various crystallizations of civil society in postsocialist transformation in Serbia. At particular turning points, the agency of civil society wasn’t only about “projects,” or very elitist agendas; it was also about involvement in politics and mobilizing society. For example, during the ouster of Slobodan Milošević in 2000, the liberal, NGO-ized civil society was vital for enlisting the support of wider middle classes for a liberal, pro-Western turn. I was very happy to see you using the notion of class, which is unfashionable in many circles now. My second Gramsci book is in part an attempt to recuperate the notion of class. I think one of the problems now is that “class” is often seen as a narrow economic concept. One of the reasons I like Gramsci is that he offers us a way of thinking about structured inequalities in society that are very open and flexible, allowing us to trace the myriad forms they assume in particular places at particular times. Combined with ethnography, Gramsci lets us to chart the ways inequality actually operates in practice. Likewise, Gramsci’s concept of civil society—a very fluid concept in the Prison Notebooks—is extremely useful for thinking how people organize themselves in ways that are distinguishable from the state in certain contexts, but part of the state in other contexts. Still, the notion of civil society doesn’t actually tell us anything specific about particular groups in particular places. We can only discover that through careful empirical analysis. Exactly. One thing I tried to attend to in writing this book was to make it explicit how transition was particularly destructive in Serbia, and outcomes there are different from countries in Central and Eastern Europe. In Serbia, like other postsocialist countries, old industries were largely closed down or destroyed through asset-stripping privatization, but while in countries such as Czech Republic, Poland, or my native Slovakia foreign investment promoted a lot of reindustrialization and the emergence of new working classes, Serbia saw a little of that. People who used to be workers, as well as their children, are now much more likely to work in services or in the informal economy; there is also huge unemployment. All this leads to a different sort of class-consciousness, and a different setting for the development and practices of civil society. You also make an interesting argument about nationalist groups, class, and civil society that is a bit different from what we normally hear about Eastern Europe. How is Gramsci influencing this analysis? Nationalist movements in Eastern Europe and elsewhere are often associated with frustrated working classes and de-classed people, but I think this is profoundly untrue in places like Serbia. Many of the leaders of nationalist movements are university-educated people with middle class careers. So, similar to liberal NGOs, civil society works as a representational arena in which certain actors are trying to represent other people who aren’t themselves so closely involved in political organizing and hegemonic struggles. I wouldn’t go so far as to call the leaders of nationalist organizations “organic intellectuals” in Gramsci’s sense, but I think there is an affinity with that role. They are people not terribly distant from those most dispossessed by postsocialist transition, but they are not themselves part of those groups. It’s important to consider this social context in Serbia since social interests and social classes are much more hazy precisely because of the form that the postsocialist transition has taken. All these identities were called into question—you can’t call yourself a worker after years of unemployment or informal work. But I think there are different aspects to this. There is a question of the content of identities, for example what the category “worker” means to people in a specific place, at a specific time, but then there is also the question of what kind of economic locations there are, what possibilities exist or don’t exist for different people, for example the cleavage between those who are in a position to benefit from privatization and those who aren’t. So you have this dissolution of previous social locations and new locations not-yet-coalesced. An interesting question is how that translates into the narratives people use to explain the world. These are understandings of the world generated by experiences of subalternity, dispossession, and so on, but once certain assumptions and beliefs emerge and begin to take on more coherent form, they may well appeal to people who have not themselves experienced that particular form of subalternity. The crucial point that is often forgotten is that none of us experience the world directly; our experiences are always mediated through the different narratives that constitute major parts of our social worlds. A key question is why some of the narratives appear plausible and some don’t; to whom exactly do they appeal, and why? Kate Crehan is Professor of Anthropology (Emerita) at City University of New York. Marek Mikuš is a research associate at the Max Planck Institute for Social Anthropology and a research fellow at Trinity College Dublin. Deborah Jones is contributing editor for the Soyuz Postsocialist Studies Network’s AN column. She welcomes suggestions for additional author conversations that might interest Soyuz members.